SPOILER ALERT: The below feature discusses recent plot developments in Rebirth. If you’re a few issues behind, proceed with caution. It’s been three months now since Rebirth launched with Geoff Johns’ DC UNIVERSE: REBIRTH. Since then, we’ve seen the debut of 25 different comics that have continued carrying the Rebirth torch in thrilling, emotional and utterly exciting ways. With many of these comics releasing twice monthly, some of them are now either nearing or reaching the end of their first story arcs. Wrapping up these initial storylines has obviously brought some resolution to the tales that have kept us eagerly reading since June, but it’s also introduced new mysteries or furthered questions we may have already been asking ourselves. In short, even three months into Rebirth, there’s still quite a lot to ponder about this latest chapter in the lives of your favorite heroes. Every Rebirth comic has its mysteries, but we thought it would be fun to look at some of the Rebirth books that have been running the longest and share a few of the questions we’ve been asking ourselves. Remember, when it comes to the top secret world of Rebirth, all of us here at DCComics.com know about as much as you do. These are as big of mysteries to us as they are to you! What Ominous Role Does Gotham Girl Play in Batman’s Future? In a series of caption boxes, King manages to drop several bombshells. First, there’s the fact that Duke Thomas and Claire Clover—two characters who aren’t even in a relationship at this point in the story—seem destined to tie the knot. Second, it’s clear that Gotham Girl has a future in the DC Universe. Her story doesn’t end with her brother’s. And finally, that she seems to be responsible for the death of Batman. We suspect that things aren’t all as they seem now, but man oh man, are we excited to see what happens next. 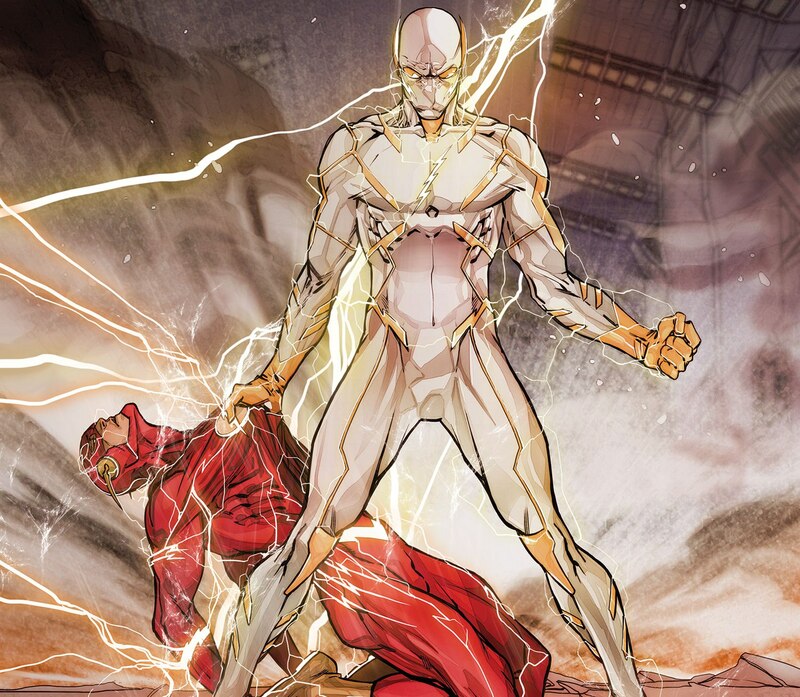 In recent issues of The Flash, Barry has had his supersonic hands full trying to help the dozens of new speedsters that emerged after a (seemingly) freak Speed Force storm granted speed powers to all of them. It’s not been an easy task. It’s easy to forget how dangerous and destructive super speed can be when you don’t know how to manage it, and when you multiply that unpredictability by a number well into the double digits, even the World’s Fastest Man is going to have a hard time staying on top of it all. All this is to say nothing about the science-based terrorist group, the Black Hole, and the homicidal speedster calling himself Godspeed that makes things deeply personal for the Flash in today’s THE FLASH #5. But who is Godspeed? That’s the big question. He seemingly came out of nowhere, possessing a much greater understanding of the Speed Force than any of the other new speedsters. So…is he new? Is he one of the students that the Flash is training at S.T.A.R. Labs? We know exactly two things at this point—his abilities seem to rival Barry’s and he’s willing to kill to get more speed. We’re guessing there’s a lot more to this frightening new villain, and we eager to find out who’s behind the mask. Is Lex Luthor Really Turning Over a New Leaf? Is there any comic that’s been living up to its title as much as Action Comics? The debut storyline, “Path of Doom,” written by Dan Jurgens and drawn by Patrick Zircher, Tyler Kirkham and Stephen Segovia has been relentless and thrilling, as Superman once again squares off against Doomsday while trying to protect his family. However, alongside all the action, Jurgens has managed to introduce quite a few mysteries into the world of the Man of Steel. Who is this newly emerged, powerless Clark Kent? Who is the mysterious hooded figure who has been observing Superman since Action Comics relaunched? And the question we’re most curious about: Is Lex Luthor serious about being a hero? Anyone who knows Lex Luthor knows that you can’t trust him, and Superman is rightly skeptical about Lex’s heroic intentions. Lex’s motivation does seem to be rather self-serving, but allow us to play bald-headed devil’s advocate for a moment. Over the past two years, Lex has been trending more towards heroism than villainy. He joined the Justice League shortly after the events of “Forever Evil,” and while his time with the team was certainly volatile, he did manage to do some good. In recent issues of Action, he’s shown a willingness to work with the DCU’s “new” Superman and follow his instructions. In today’s ACTION COMICS #962, he does seem pretty concerned with making sure the people of Metropolis are safe. Is it enough to definitively label him a “good guy”? Maybe not, but we have to admit, even if it’s ego-driven, Metropolis does seem to be a better, safer place now that Lex has donned the suit. Why Can’t Wonder Woman Remember the Way Back to Themyscira? In “The Lies,” the present day story by Greg Rucka and Liam Sharp currently unfolding in odd-numbered issues of Wonder Woman, Diana has discovered that her memories have been manipulated and that the past as she recalls it is a lie. However, her search for the cause has revealed another mystery—she can no longer remember the way to Themyscira. To help her rediscover it, she sought out Barbara Ann Minerva, the Cheetah, for aid and the two frequent enemies have formed an uneasy truce. But why can’t Diana remember? In today’s WONDER WOMAN #5, she reveals that when an Amazon leaves Themyscira, she can only return if her patron gods permit access. Up until now, the gods have always given that access to Diana. Have they now forsaken her? And if so, why? Are Wonder Woman’s problems caused by the gods, a human enemy or something in between? Let’s face it. Things aren’t looking good in Justice League at the moment. There’s a fleet of powerful alien ships heading towards Earth. Someone has buried a number of devastating “extinction machines” in the Earth’s core that seem to be capable of destroying the planet. And of course, millions of people across the world have seemingly become possessed and merged into four massive beings that call themselves the Kindred. Are all three of these things related? We don’t know for certain, but if they are, the Kindred are clearly at the heart of it. But who are they? What do they want? They’ve taken control of millions of people and Rao only knows if it’s possible to be restored after converging into a giant glowing monster. However, the Kindred don’t seem openly malevolent. They speak strangely of stolen powers and magic, and of joining together to “sing.” But much of what they’ve said could be interpreted as an attempt to save the world. If that’s their intention, though, they have a weeeeeird way of showing it. Sadly, we’ll have to wait until September 7th’s JUSTICE LEAGUE #4 before we learn more about the Kindred…and discover whether or not we’re all doomed. Those are five questions we’ve been pondering, but there are plenty of others to be found in Rebirth. Which mystery is keeping you up at night? What are your theories on the questions discussed above? Let us know your thoughts in the comments, and as always, thank you for reading!